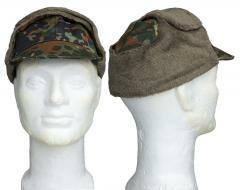 This piece of headgear is worn mainly for two reasons - it is very warm and unbelievably ugly. 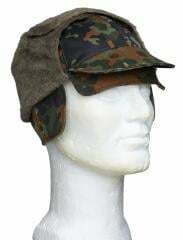 After rough experience gained in the Second World War the Germans realized that field equipment should be designed with more emphasis on practical functionality, and looks in parades became less important. 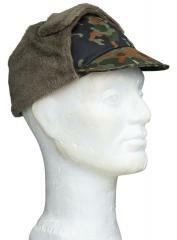 The hat is basically a field cap with insulating lining. Flaps on the sides can be lowered to cover the ears and chin. The inside is green imitation fur. 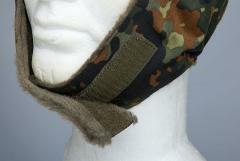 Another flap without lining is located under the visor, which can be turned to cover the forehead (or eyes for extra challenge), and a lightly insulated strip can be turned down to protect the ears and back of the head. The hat is designed to fit under a helmet and does so quite well. In addition to military purposes this serves anyone who rides a bike during cold weather. Circumference of the head in centimetres is a common European sizing system. 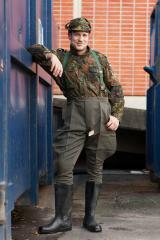 Because these are used and might have shrunk a bit, we advise to size up one step. Don't wash this item. Chemical cleansing with tetrachlorethylene is advised. These are in used, but good condition. Genuine German surplus!